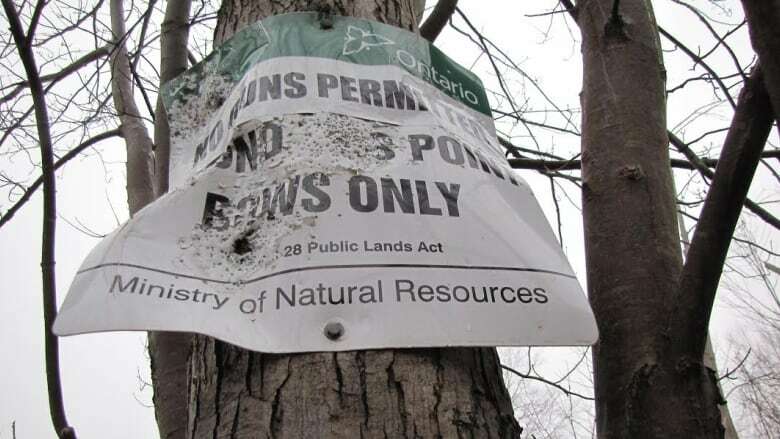 A Chatham-Kent couple are taking legal action against the provincial government over the issue of hunters who they say have been ignoring rules and acting carelessly while using guns on Crown-owned land near their home. Malcolm and September MacAlpine own a property that lies next to 35 hectares of Crown land — known as the Harwich Land Tract — near Highway 401 and Communication Road in the Chatham-Kent area. A six-hectare portion of this land was converted to a wetland in 2012. Since that time, the MacAlpines say a number of hunters have been ignoring the rules and putting the couple and others at risk through their hunting activities. "They shoot year-round and day and night, even though it's illegal to be hunting at night," Malcolm MacAlpine told CBC Radio's Afternoon Drivein an interview on Tuesday. The MacAlpines say the use of bows is permitted for hunting on the wetland portion of the Crown property, but guns are not allowed. However, they say gunfire has hit trees on their property and landed close to the couple and their home on some occasions. And they say hunters have trespassed onto their property, too. The MacAlpines say this combination of circumstances creates a safety issue for the couple and it is also bad for their business, as the tree farm they run is located on the same property. "Gunfire entering the Plaintiffs' property has created serious health and safety risks for the Plaintiffs and guests of the Plaintiffs, as well as agents and customers of the Plaintiffs' tree farming business," reads a portion of a 10-page statement of claim the couple filed in Ontario's Superior Court last year. "The concerns are substantial and constitute unreasonable interference with the use and enjoyment of the Plaintiffs' property." The couple also alleges there are hunters who are firing shots that are endangering motorists who are driving by the land on Highway 401. Malcolm MacAlpine said it is "without question" that shots fired from some hunters' guns could easily make their way across the nearby highway, one of the busiest trade routes in Canada. Daniel Whittal, a Chatham-based lawyer, is representing the MacAlpines in their fight with the government. "It's not particularly easy, perhaps rightly so, to be able to just sue the government and have the courts be able to dictate to the government what they're allowed to or not allowed to do," Whittal told Afternoon Drive, when appearing on the program at the same time as his clients. "And so, the law allows for us to make an application, but it's under the Charter of Rights and Freedoms, which really, fundamentally exists to protect an individual's rights from being violated by the government." Part of the MacAlpines' statement of claim alleges that the hunting being allowed on the Crown land near their home is violating Section 7 of the Charter, which relates to the life, liberty and security of an individual. "We can apply that pretty quickly to the MacAlpines' situation here, because the Ontario government is violating Malcolm and September's right to security of the person through their inaction in correcting the situation," Whittal said. "And I think, without exaggeration, we could describe the situation as quite terrifying." The MacAlpines' lawyer told Afternoon Drive that the couple are requesting, among other things, that the court order a stop to hunting on the Harwich Land Tract. Whittal said that discussions continue with a Toronto-based Crown attorney regarding the MacAlpines' issues, but the case has not yet gone before a judge. "We have some hope that some sort of resolution can be reached that way," said Whittal. "However…if we need to put it in front of a judge to make the decision, we believe that we'll find that support in our legal system." Jolanta Kowalski, a spokesperson for the Ministry of Natural Resources and Forestry, said the ministry would not be offering comment at this time as the issue is still before the courts.